Garden sundials are used as a clock that works via sun time, not clock time. 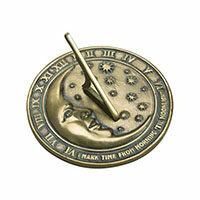 Mathmeticians and historians love the concept of sundials and sun time. Positioning a Garden Sundial to read the time of day as accurately as possible requires some research and study. To make it easier for our customers, we've done all the research. There are two different types of garden sundials. Horizontal Garden Sundials which lay flat on the ground or can be placed on a pedestal and Armillary sundials that are a bit more detailed in design and have a larger Gnomon. 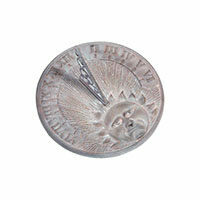 Horizontal sundials have many diffent designs and styles of gnomons. You can place a horizontal garden sundial either in flower beds or on pedestals near the garden or walkway, depending on where the best sun and shadow combo are. Although the time of horizontal sundials isn't quite as accurate as Armillary sundials, they are much easier to position and are very easily moved. Horizontal garden sundials only need to be angled if they were designed for a latitude other than where they are being used. The Armillary sundial takes a little more work on proper placement to see the most accurate time. The Armillary sundial operates basically the same way as the horizontal sundial does. 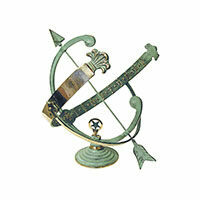 Armillary sundials keep track of time more accurately than a standard garden sundial. Most Armillary sundials have a fixed gnomon aligned with the Earth's rotational axis, as well as a shadow-receiving surface symmetrical to the axis. Sundials need to point in the direction of True North, and the style (either a sharp straight edge or thin rod, often located at the edge or tip of the gnomon) must be aligned with the Earth's rotational axis. The direction of True North is not the same as the north magnetic pole, but instead is marked by the north celestial pole. True North is found at latitude 90N, and is the direction along Earth's surface towards the North Pole. 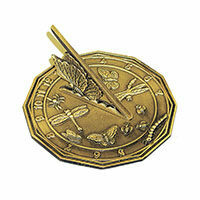 A compass will work for small garden sundials, but is not very accurate. 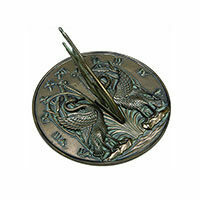 A compass only helps to locate the magnetic north, but this will serve the typical garden sundial perfectly well. Garden sundials are designed for function, but many owners are happy just to have a sundial that is close enough to being accurate. You can also position a true vertical object at exactly local noon and mark the shadow. You will want to find a reliable method of marking the shadow at the instant of local noon. 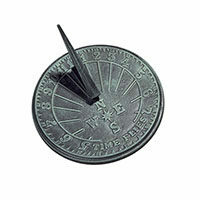 You can also position your sundial so that there is no shadow shown at high noon. The shadow should appear to the left in the morning, and to the right in the afternoon. The sun will appear at times to be faster and slower than our watches read, again because sun time and clock time are not the same. The sun appears "fast" from mid-April through mid-June, and early September through late December. When the sun appears "fast" it will reach sun-noon (be directly overhead) not at 12:00:00 by your watch, but a few minutes earlier. When you are setting up your horizontal sundial, you want to know the time the sun is directly overhead. There are certainly more advanced methods of determining True North, and setting sundials for accuracy, but our horizontal garden sundials can be set using the methods above. You will enjoy watching how the shadows on your sundial change through the seasons and how sun time really works. 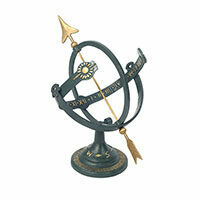 Garden and Armillary Sundials are often bought as gifts, and when traveling. Bringing home a sundial that was produced outside of your area of longitude will require that you check the angle of the gnomon. 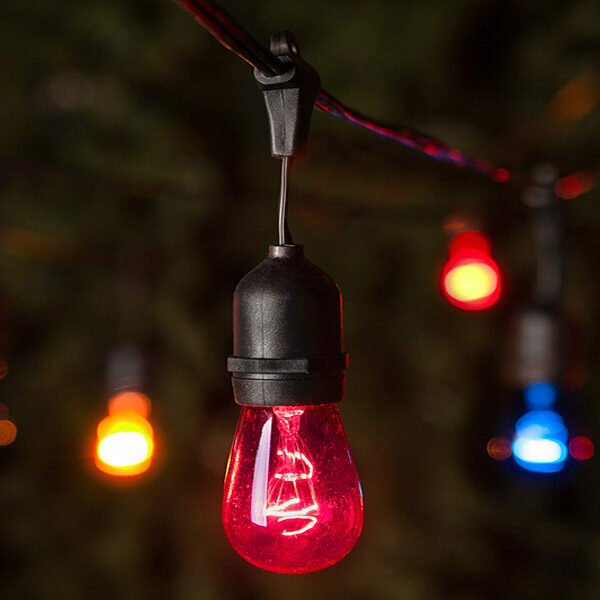 The gnomon is a bar or stretched wire parallel to the celestial axis, and the face is a semi-circle. A sundial made for the south of Spain will have an angle of 37 and will not tell the correct time if it is set up with the horizontal dial plate in Birmingham, Alabama where latitude is 52.5N. You should check the angle of your gnomon regardless of where it was purchased and is set up, just to be certain your sundial is ready to tell sun-time. A common method for checking the angle of the gnomon is to measure the angle with a protractor, and then crosscheck your measurement to ensure that the hour lines have been laid out correctly. You can back-calculate the gnomon angle from the angles of the hour lines. For example, the angle of the 9am and 3pm hour lines from the noon line is 2624 at 30N, 2950 at 35N, 3244 at 40N, 3516 at 45N, 3727 at 50N, and 3920 at 55N. Additional information can be found through research for more complicated sundials and gnomons. If your gnomon is indeed angled incorrectly for your geographical location, you can use a wedge to bring the gnomon parallel to the earth's axis. 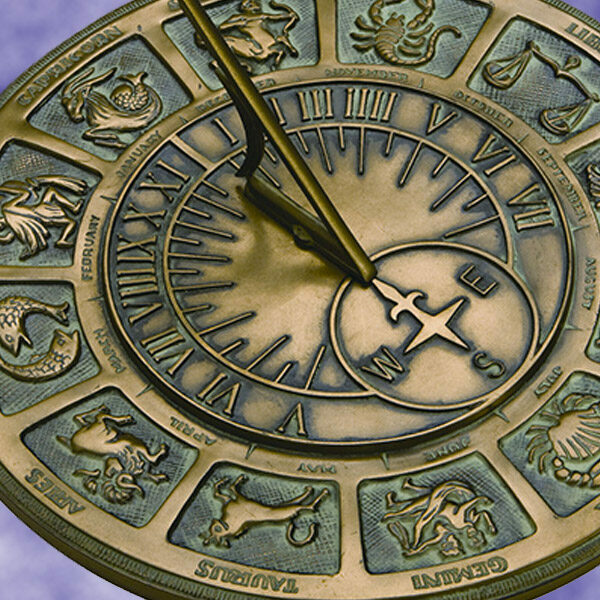 Armillary sundials are equiangular with straight hour lines that are equally spaced apart. To correct for longitude with an armillary sundial, rotate the dial surface by the difference in longitude without changing the gnomon. 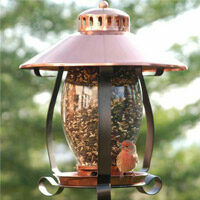 The research above should be able to set up a garden sundial as accurately as possible. Enjoying the beauty and function of your sundial will be a different kind of experience after learning about sun time vs. clock time, the direction of true north, and how to angle your gnomon correctly.